Parents of children in England who persistently truant should have their child benefit cut, according to a key government adviser on school behaviour. Behaviour tsar Charlie Taylor says unpaid truancy fines should be recovered directly from child-benefit payments in a crackdown on absenteeism. The current system of penalty notices is ineffective, he says, as non-payment rarely leads to prosecution. He also urges primary schools to pick up on patterns of absenteeism earlier. Mr Taylor was asked by Education Secretary Michael Gove to look at the issue of school attendance in the wake of England's riots last September. Both Mr Gove and Prime Minister David Cameron have expressed support for tough sanctions for persistent truancy through the benefits system. Publishing his review, Mr Taylor will say 54m days of school were missed last year even though some schools went to great lengths to tackle attendance issues. The latest figures show 400,000 children were persistently absent from England's schools in the past year and missed about one month of school each. Currently, penalty notices for truancy can be issued to parents who allow their children to miss too much school. They can be issued by head teachers, council officers and the police, and lead to fines of £50 - doubling to £100 if parents fail to pay within 28 days. At this point the issuer has to prosecute or withdraw the penalty notice. Mr Taylor's report highlights the fact that of the 127,000 penalty notices issued since their introduction in 2004, around half were unpaid or withdrawn. Mr Taylor wants the fines increased to £60 in the first instance, doubling to £120 if they are unpaid after 28 days. At this point the money would then be automatically recovered from child benefit payments. But county court action would follow for those parents not in receipt of child benefit. Mr Taylor says: "Some parents simply allow their children to miss lessons and then refuse to pay the fine. It means the penalty has no effect, and children continue to lose vital days of education they can never recover. "Recouping the fines through child benefit, along with other changes to the overall system, will strengthen and simplify the system. It would give head teachers the backing they need in getting parents to play their part." General secretary of the Association of School and College Leaders Brian Lightman said schools had made real progress in improving attendance but needed the full support of parents if they were to go further. "Schools do not want to have to resort to fining parents, but sometimes it is the only option left. For these rare cases, the system needs streamlining so that fines are an effective deterrent rather than an idle threat. ASCL supports the report's recommendations in this area." But National Union of Teachers general secretary Christine Blower said the effect of regular absenteeism from school on a pupil's confidence and ability to understand what is being taught in the classroom is greatly affected. "However it is not an issue that will be solved by fining parents. Deducting money from child benefit will have huge financial repercussions for many families. Having less money for food and bills will simply create a whole new set of problems." Labour's Shadow Education Secretary Stephen Twigg said it was right to fine parents of persistent truants. "However, it is even more important to ensure that truancy is prevented or tackled early. Schools need to be places children want to attend with engaging teaching and a relevant curriculum. "The government is also cutting back on education welfare officers who can identify truancy early." Alison Garnham, of the Child Poverty Action Group, agreed saying benefit cuts like this could place added pressure on some already stretched families. She said: "Child benefit has been frozen. We know that it's spent on meeting the cost of children, that's what it's for, but families are also facing a lot of austerity cuts - £18bn of benefit cuts. 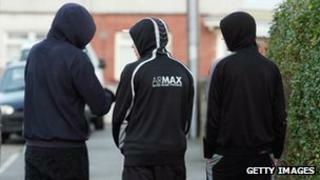 The Institute for Fiscal studies says there will be 800,000 more children in poverty by 2020. "So this problem is likely to get bigger because we know that there's a strong association between poverty and low income and truancy. Previous government reports have said this." Helen Dent, chief executive of charity Family Action, said fining parents was not the best way to improve achievement and reduce truancy. "Some children miss school for understandable reasons - they may be young carers or have disabilities which impact on their attendance. "It is important that the right support is in place to get these children through the school gate and concentrating on their studies."